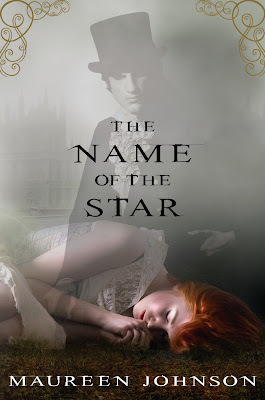 Name of the Star won't be available for purchase until September 29, but the first 78 pages of the YA supernatural mystery are available online right now for free. Think of it as sort of an amuse bouche to whet your appetite 'cause we'll be giving away a copy in just a few weeks! Find out more about the book and where you can download it after the jump. Johnson's trademark sense of humor serves to counterbalance some grisly murders in this page-turner, which opens her Shades of London series. Rory Deveaux trades the sultry heat of Louisiana for the academic rigors of a London boarding school, only to arrive in the middle of a spate of murders that echo those committed by Jack the Ripper. As one mutilated body after another turns up, Johnson (Scarlett Fever) amplifies the story's mysteries with smart use of and subtle commentary on modern media shenanigans and London's infamously extensive surveillance network. With the sordidness of Criminal Minds and the goofiness of Ghostbusters, it's a fresh paranormal story. Rory is a protagonist with confidence and a quick wit, and her new friends are well-developed and distinctive—both the "normal" ones and those who, like Rory, can see ghosts—and Wexford, Rory's new school, is an appropriately atmospheric backdrop to this serial murder mystery. Rory's budding romance with a classmate takes a backseat to more pressing (and deadly) concerns, but readers looking for nonstop fun, action, and a little gore have come to the right place. Excited yet? Good. Now go download the excerpt on Scribd. Me too! I just have to wait till I finish Handmaid's Tale first.